The knee joint is a hinge type synovial joint, which mainly allows for flexion and extension (and a small degree of medial and lateral rotation). It is formed by articulations between the patella, femur and tibia. In this article, we shall examine the anatomy of the knee joint – its articulating surfaces, ligaments and neurovascular supply. 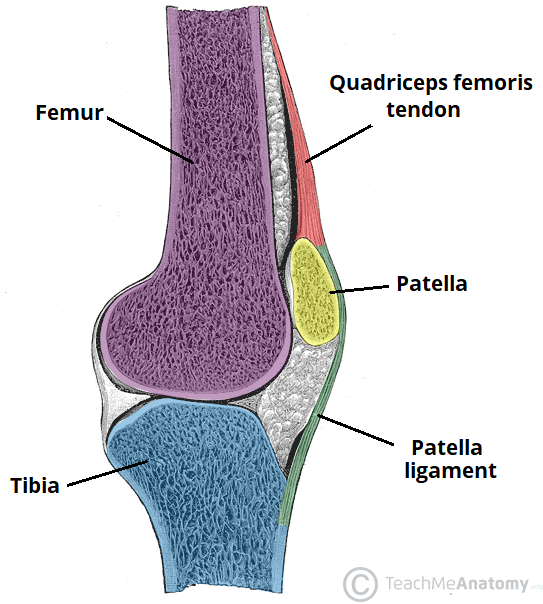 Fig 1 – The femur, tibia and patella of the knee joint. Fig 1.1 – More detailed view of the bony surfaces. The inferior surface of the femur and superior surface of the tibia is shown. 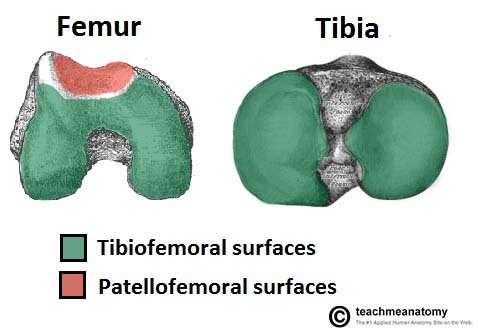 Tibiofemoral – medial and lateral condyles of the femur articulating with the tibial condyles. Patellofemoral – anterior aspect of the distal femur articulating with the patella. The tibiofemoral joint is the weight-bearing joint of the knee. The patellofemoral joint allows the tendon of the quadriceps femoris (the main extensor of the knee) to be inserted directly over the knee, increasing the efficiency of the muscle. As the patella is both formed and resides within the quadriceps femoris tendon, it provides a fulcrum to increase power of the knee extensor, and serves as a stabilising structure that reduces frictional forces placed on femoral condyles. Both joint surfaces are lined with hyaline cartilage, and enclosed within a single joint cavity. The blood supply to the knee joint is through the genicular anastomoses around the knee, which are supplied by the genicular branches of the femoral and popliteal arteries. The nerve supply, according to Hilton’s law, is by the nerves which supply the muscles which cross the joint. These are the femoral, tibial and common fibular nerves. To deepen the articular surface of the tibia, thus increasing stability of the joint. To act as shock absorbers by increasing surface area to further dissipate forces. They are C shaped, and attached at both ends to the intercondylar area of the tibia. In addition to the intercondylar attachment, the medial meniscus is fixed to the tibial collateral ligament and the joint capsule. 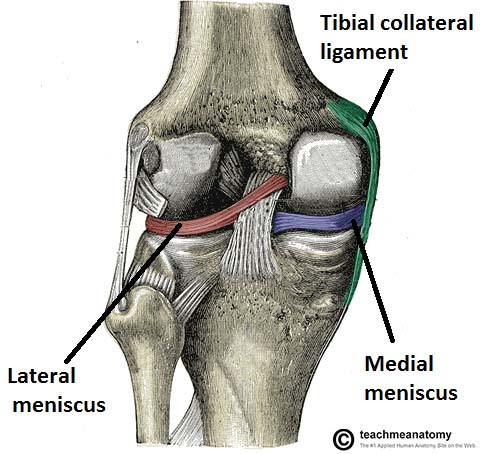 Damage to the tibial collateral ligament usually results in a medial meniscal tear. The lateral meniscus is smaller and does not have any extra attachments, rendering it fairly mobile. A bursa is synovial fluid filled sac, found between moving structures in a joint – with the aim of reducing wear and tear on those structures. There are four bursae found in the knee joint. Suprapatella bursa – This is an extension of the synovial cavity of the knee, located between the quadriceps femoris and the femur. Prepatella bursa – Found between the apex of the patella and the skin. Infrapatella bursa – Split into deep and superficial. The deep bursa lies between the tibia and the patella ligament. The superficial lies between the patella ligament and the skin. Semimembranosus bursa – Located posteriorly in the knee joint, between the semimembranosus muscle and the medial head of the gastrocnemius. Fig 1.4 – Sagittal view of the knee joint, showing the major bursae. Patellar ligament– a continuation of the quadriceps femoris tendon distal to the patella. It attaches to the tibial tuberosity. Tibial (medial) collateral ligament – A wide and flat ligament, found on the medial side of the joint. Proximally, it attaches to the medial epicondyle of the femur, distally it attaches to the medial condyle of the tibia. Fibular (lateral) collateral ligament – Thinner and rounder than the tibial collateral, this attaches proximally to the lateral epicondyle of the femur, distally it attaches to a depression on the lateral surface of the fibular head. Anterior cruciate ligament– it attaches at the anterior intercondylar region of the tibia where it blends with the medial meniscus. It ascends posteriorly to attach to the femur in the intercondylar fossa. It prevents anterior dislocation of the tibia onto the femur. Posterior cruciate ligament– attaches at the posterior intercondylar region of the tibia, and ascends anteriorly to attach to the anteromedial femoral condyle. It prevents posterior dislocation of the tibia onto the femur. Fig 1.5 – Anterior view of the knee joint, showing some of the major ligaments. 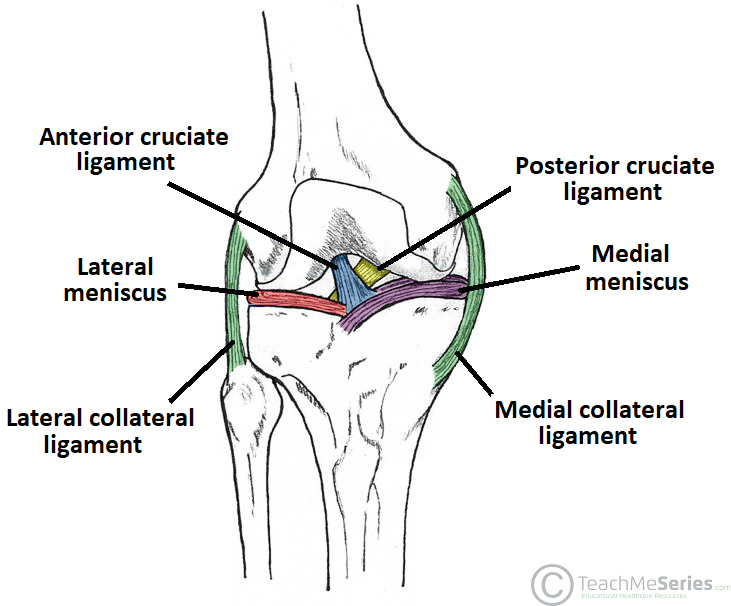 The patella ligament is situated on the anterior aspect of the knee joint, and is not visible is this diagram. Extension: Produced by the quadriceps femoris, which inserts into the tibial tuberosity. Flexion: Produced by the hamstrings, gracilis, sartorius and popliteus. Lateral rotation: Produced by the biceps femoris. Medial rotation: Produced by five muscles; semimembranosus, semitendinosus, gracilis, sartorius and popliteus. NB: Lateral and medial rotation can only occur when the knee is flexed (if the knee is not flexed, the medial/lateral rotation occurs at the hip joint). Injury to the collateral ligaments is the most common pathology affecting the knee joint. It is caused by a force being applied to the side of the knee when the foot is placed on the ground. Damage to the collateral ligaments can be assessed by asking the patient to medially rotate and laterally rotate the leg. Pain on medial rotation indicates damage to the medial ligament, pain on lateral rotation indicates damage to the lateral ligament. If the medial collateral ligament is damaged, it is more than likely that the medial meniscus is torn, due to their attachment. The anterior cruciate ligament (ACL) can be torn by hyperextension of the knee joint, or by the application of a large force to the back of the knee with the joint partly flexed. To test for this, you can perform an anterior drawer test, where you attempt to pull the tibia forwards, if it moves, the ligament has been torn. The most common mechanism of posterior cruciate ligament (PCL) damage is the ‘dashboard injury’. This occurs when the knee is flexed, and a large force is applied to the shins, pushing the tibia posteriorly. This is often seen in car accidents, where the knee hits the dashboard. The posterior cruciate ligament can also be torn by hyperextension of the knee joint, or by damage to the upper part of the tibial tuberosity. To test for PCL damage, perform the posterior draw test. This is where the clinician holds the knee in flexed position, and pushes the tibia posteriorly. If there is movement, the ligament has been torn. Friction between the skin and the patella cause the prepatella bursa to become inflamed, producing a swelling on the anterior side of the knee. This is known as housemaid’s knee. Similarly, friction between the skin and tibia can cause the infrapatella bursae to become inflamed, resulting in what is known as clergyman’s knee (classically caused by clergymen kneeling on hard surfaces during prayer). As the medial collateral ligament is attached to the medial menisicus, damage to either can affect both structure’s functions. 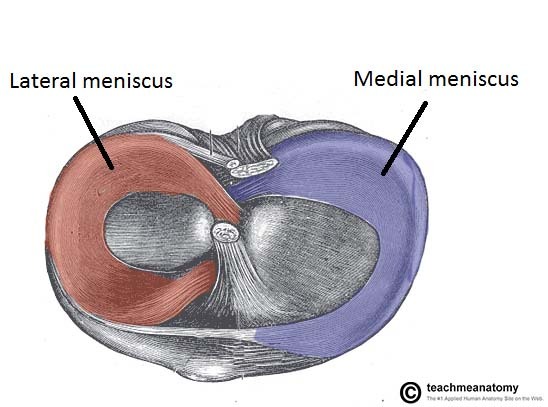 A lateral force to an extended knee, such as a rugby tackle, can rupture the medial collateral ligament, damaging the medial meniscus in the process. The ACL is also affected, which completes the ‘unhappy triad’. Which of the following is the correct classification of the knee joint? The tendon of which muscle group attaches to the patella? Which type of cartilage are the menisci comprised of?